So you’re going to be a parent…what comes next? At Teen Parent Connection, we recognize that parents-to-be need a lot of support and information during pregnancy, labor, and delivery. If you are a resident of DuPage County, at least 22 weeks pregnant and under the age of 22, you may qualify for our Doula Program. A Doula may also be present during the labor process, providing emotional support, information, and physical comfort measures while serving as an advocate for you. Teen Parent Connection recognizes that pregnancy, labor, and delivery is different for every family, therefore doulas are devoted to working with you to create a unique home-visiting experience to meet your needs. Teen Parent Connection services are always free of charge. 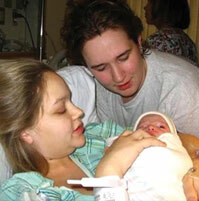 Teen Parent Connection’s Prenatal Groups are held in eight-week sessions and are facilitated by agency Doulas. The groups allow young parents to come together in a supportive environment to learn about their changing bodies, healthy prenatal lifestyles, and what to expect as they prepare to welcome a baby into their lives. Download the most recent Prenatal Group flyer here, to learn more about dates and location. Social and emotional support is important during pregnancy and parenting, and Childbirth Education Class offers you the opportunity to meet other parents-to-be that might share your concerns, questions, and goals. Classes are offered free of charge and are held in eight-week sessions. Download the most recent CBE flyer for the Glen Ellyn class here!